Nathan Oliveira has been exploring the theme of the solitary figure since the late 1950s. In his watercolors, paintings, monotypes, and sculpture he has consistently created distinctive variations of the abstracted human figure in ambiguous, often mysterious space. This exhibition features a diverse selection of his vibrant watercolors and drawings from 1960 to 2010. Oliveira’s watercolors and drawings are about immediacy, about an intuitive response to the poses of a model in his studio. He works rapidly during these sessions, as his models change positions frequently to inspire new reactions from the artist. “I’m not controlling the poses. I find them. I discover them,” he has said about his process. This sense of immediacy is seen in the fluid forms of the sexually charged nudes in the exhibition. Applying washes of earth tones with brushes loaded with water, he paints broad areas of color with remarkable fluency. He also often creates a puddling effect by applying watercolor over previously painted, dried areas, breaking down the first layer into complex abstract patterning. At times, he achieves further definition of the figure by quickly adding charcoal or pencil line. As with his paintings, he is not concerned with the formal aspects of placing his figures in an environment. Space is created by the figure’s presence, in the absence of the most basic notations of setting or atmosphere. “I wanted it to be totally open and these [figures] were simply floating in the middle of it somewhere,” he has said. The exhibition also includes a rare group of ink drawings from the 1960s. These intimate, sensuous works were generally done with a more sustained engagement with the model. Facial features and details of walls and furnishings are often evident, while the overall intent of creating an immediate impression remains the same. Ultimately, spontaneity is key to all aspects of Oliveira’s drawing method, resulting in bold, direct renderings that capture a momentary encounter between artist and model in a burst of creative energy. Oliveira’s first drawings and watercolors emerged from his engagement with aspects of Abstract Expressionism, as did his painting in the early days of his career. He has identified the most important characteristics of this work as chance, risk and gesture, which he combined with a personal concern for more traditional aspects of figure painting. Oliveira has been drawing from the model since the mid-1950s, when he joined several Bay Area artists including Richard Diebenkorn, David Park, Elmer Bischoff, and others who met regularly. He later moved away from the group and continued to work on his own. 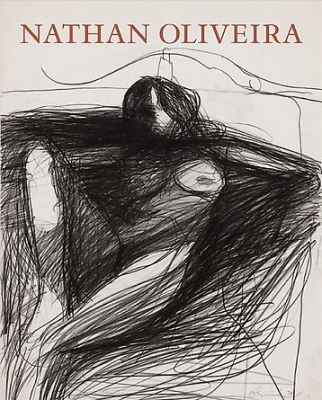 In 1959, Oliveira achieved national recognition when four of his paintings were included in a groundbreaking exhibition, New Images of Man, at the Museum of Modern Art in New York. By the early 1960s, several solo and group exhibitions in Spain, Italy, Switzerland, England, and the Netherlands had expanded his reputation internationally. He accepted a tenured teaching position at Stanford University in 1963, where he remained until his retirement in 1995. Oliveira’s work is in the collections of museums throughout the United States, including the Museum of Modern Art, New York; Whitney Museum of American Art; Museum of Fine Arts, Boston; Hirshhorn Museum and Sculpture Garden; Art Institute of Chicago; and San Francisco Museum of Modern Art. A color catalog is available.